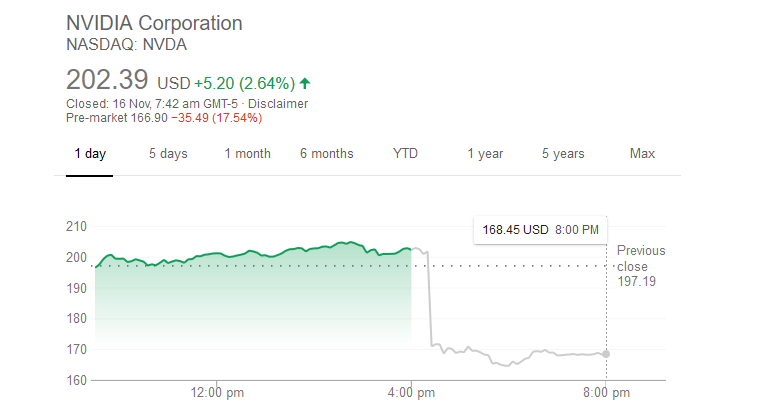 NVIDIA stock collapsed in the after-market hours by more than 17.5% and was trading at $166.9 pre-market at the time of writing. This is a 180-degree inversion of the $300 ambitions the stock was chasing just a couple of months ago. The bears are in charge of the stock for now, but are they here to stay? We will look at what went wrong with NVIDIA’s disastrous third-quarter earnings after a streak of record-breaking quarters and what the rational outlook to the stock should be. This earnings analysis will be presented in a slightly different format from before, I will be focusing on fundamentals and dissecting the numbers this time, with very little focus on reporting the nitty-gritty of the financial details. The company reported Q3 2018 (Q3FY19) numbers yesterday and missed analyst expectations for earnings, revenue, and guidance. Analysts were expecting $3.23 billion in quarterly revenue versus $3.18 actual. GAAP and non-GAAP EPS expectations were $1.71 and $1.93 respectively, versus $1.97 GAAP and $1.84 actual EPS. The consensus for the January quarter was $3.4 billion versus $2.7 billion actual guided by the company. So did NVIDIA drop the ball? Well, let’s find out. Is NVIDIA (NASDAQ:NVDA) a Sell, Hold or a Buy right now? Ethics disclaimer: I hold no NVDA (or related tech companies) securities and have no plans to do so for the foreseeable future. Any investment advice contained in this article is accurate to the best of my knowledge, is given on an “as is” basis free of charge and you, the reader, assume all responsibility for any trading plays. I have received no compensation from any entity apart from the publication for whom I work for. The first thing we need to look at is how the stock performed in a vacuum. 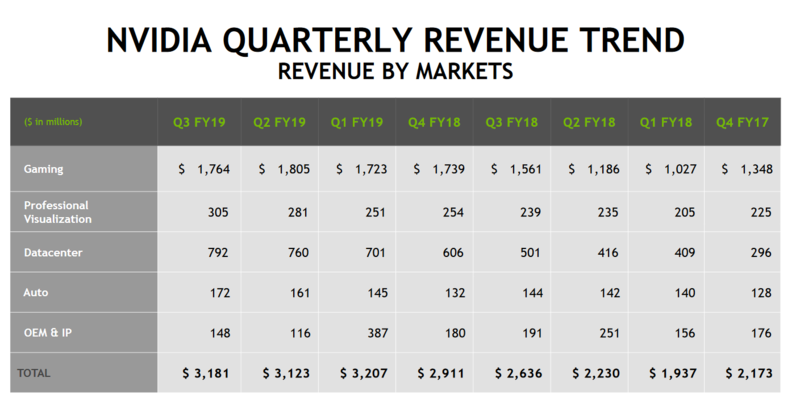 NVIDIA reported 1.8% QOQ and 20.6% YOY growth in revenues. The company beat the GAAP EPS consensus by a considerable margin and only fared less than ideally on the non-GAAP EPS. It saw growth in all major segments – except one: gaming. In isolation, the company’s financials weren’t exceptional but they weren’t too bad either. Turing has received a cool reception and the extravagant price tag makes it unpalatable to the pretty much the most of the gaming market. Turing’s new tech isn’t even close to widespread adoption at launch (in other words, it’s unusable). The company’s gaming segment is its lifeblood and a drop in growth there is a serious concern. The cryptocurrency boom (and its positive effects) are over. The stock was trading at a high particularly because of its consistent streak of beating analyst estimates. NVIDIA has a Pascal inventory problem. NVIDIA is in pretty much a monopoly right now and anyone that does not buy Turing will almost certainly go for a Pascal (with the exception of the price point targetted by the RX 580). Turing contains new tech inside of it that has the potential to break the “hardware limits” and give graphics cards an almost magical leap in performance IF NVIDIA manages to implement it successfully (which they haven’t done so – as of yet). NVIDIA has previously priced very expensive dies at a discount just to undercut its competition and part of the reason the company chose to price Turing so high was so they don’t cannibalize their own Pascal inventory. This is one of the reasons why the company beat GAAP EPS but not non-GAAP EPS. Turing is a success in the professional segment, where the Tensor cores can go head to head against offerings from Google for the first time. So the next question then becomes, who got it wrong? Were the analyst expectations unrealistic or did NVIDIA drop the ball? In my humble opinion, analysts expectations were widely off center. We published a special pre-earnings piece talking about the reasons that could make NVIDIA screw up this quarter – and we have never done so in the past. Most of the analysts in the know knew that Turing had not received a warm reception and had tapered their expectations accordingly. For most of the analyst estimates it seems like things were still very rosy, Turing was doing great, and the cryptocurrency boom was still raging. Just like $300 price point for NVIDIA is not justified till it manages to deploy and implement Turing RTX and AI tech, the $165 price point is also not justified in our opinion simply because the company practically owns the market right now. It could go up but at the same time we must express caution. Turing could have the effect of changing mindsets to lengthen the historical upgrade cycle of gamers which would shrink the overall size of the market. This would obviously be to the detriment of NVIDIA. There is no alternative to NVIDIA right now. It’s certainly feasible that this is a buying opportunity. As we noted previously, the fundamental performance of the company has seen growth. Returns may take a while to materialise however and of course, you can be right all day but if the market thinks you are wrong, get the **** out of the way. This estimate is of course ceteris paribus and assumes financial conditions of the global economy stay the same among other things. We will also tell you the key signal to watch out for: Look for when the company cuts Turing MSRP across the board. That is when they have either written off Pascal inventory and are ready to milk Turing for all its worth or have actually exhausted it and are about to do the same. This could lead to an improvement in earnings more in line with analyst expectations but we urge readers to keep in mind that Turing is a very large and expensive chip. Cuts in price will obviously eat into margin although there is probably sufficient margin at the moment to afford them and start shifting volume.